Based on BJCP IPA Style Grouping, we want you to brew your best Indian Pale Ale ( Although Pale may optional these days). The closing date for entries to be registered is 6th August. Closing date for dropping off bottles is Friday 12th August – Drop off points to be announced. 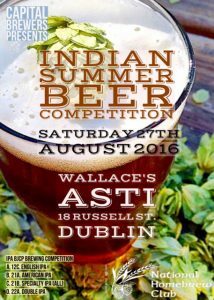 The competition will be held on Sat 27th August.. 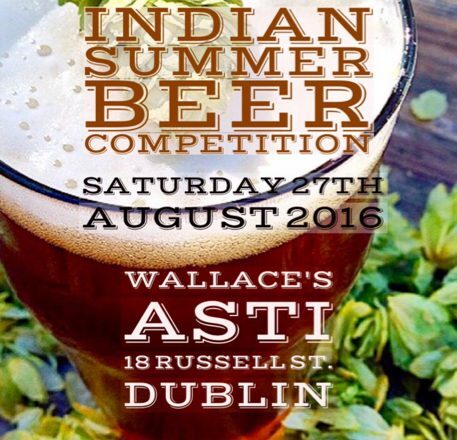 Location: Wallace’s Asti, 18 Russell Street, Dublin 1. There will be prizes for each sub-category, with a grand prize for Best of Show. Max 60 beers, (Limit: 1 beer per person per sub-category). Given the warm weather there may be an added challenge for some people but there’s plenty of tips and advice to help with this.